Accessible at the top menu bar of Etudes is your global content repository. My Resources is a private area, accessible only by the account holder. It is a content repository for many kinds of learning objects that you can make available to your class or the public, selectively. When you click My Resources in the menu, you will see resources and/or folders with resources that you have posted. 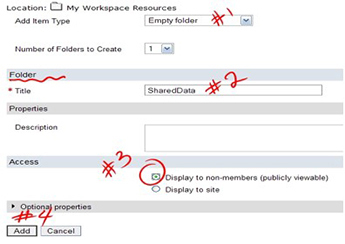 Click a resource’s title to open it, or click the folder icon next to the folder name or the name itself to open a folder. To add items to a folder, click the Add action to the right of the folder title. Check the box next to an item to remove or move that item. You can sort the list of resources by title (click Title), size (click Size), the resource creator (click Created by), and when the resources were last modified (click Last modified). To reverse the order, click any of these column headings again. simple text documents that display right on the page. In addition, you can create folders to help you organize these materials. You can have private and public folders in this area. Unless you check a folder to make it public, the default value of folders under My Resources is private (viewable only to you). You can upload up to ten resources at a time, post items in or outside of folders, create folders inside other folders, and create HTML documents in the system. My Resources are not the same as the Resources available in each course site. Resources uploaded into My Resources are not accessible or viewable to anyone else but you. UNLESS you mark them as ‘public’, or place them in folders that are marked as ‘public’, nobody else will have the ability to view them, even if you gave them the URL. The advantage of using publicly viewable My Resources folders for materials is that you can use this area as a central repository to upload resources that you can use across your sites. You can create folders for documents, media, etc. that you re-use across many of your course sites. See below how to upload or add public materials. You can use My Resources as a central repository of learning materials that can be used in all your course sites, as well as from one term to the next. Then, you can point to them from your sites. Just make sure to make them ‘public’. Be sure to on the Display to non-members (publicly viewable) option to make it viewable to the public. The folder will appear in your list of resources. When you add items into that folder, they will be available to the public. They will now have a web address that you can use to link to that item. Click on the link of the resource to open it in a new browser window. Then copy the address in the location toolbar and paste it into your lecture (or elsewhere) in order to link to that item.